Exciting FlashDogs things are happening. We had our first Zombie City Library post, in which community members save their favorite books from the apocalypse. 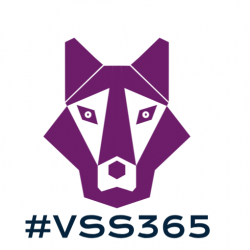 #vss365 is an incredible success. Well done to those that are prompting and contributing. FlashFeeD continues to be a source of great stories and community support. Keep it going. Invite friends. Welcome new people. No focus this week – be as creative as you like. He’d ignored all the warnings; he understood that now. On a good day he might have been able to admit to himself that there’d been no way to know they were warnings, but there weren’t any good days. So he blamed himself and retired behind his beard, masking his despair with a smile he’d practiced so often it was instinct. At the interview, Paul had asked him what made him happy. That was the second warning; the CEO wanting to be addressed by his given name had been the first. His answer had been honest because the question had been so unexpected: work made him happy. It always had, until HHJJ Designs had seduced him with desk-side masseurs, lunchroom video games, paintball weekends and rent-free dorms. And an absurdly high salary; he’d eagerly missed that warning. Work didn’t make him happy any more. Medication and constant vigilance didn’t either, but they could at least provide a reliable facsimile. The vigilance had begun on the first day, when he’d been welcomed by Paul. He’d had the usual new-boy nerves exacerbated by finding the boss waiting for him, not calling him into his office but actually standing in the parking area, in the rain, smiling broadly, ready to greet him the moment he got out of his car. He remembered Paul’s words; they’d been a warning too. He’d only been branded twice. Once ought to have been enough, but he’d received the news of his father’s death and his mask had slipped, just for a second. So now he had a smiley on each arm; ugly, livid scarring reminding him of pain and the need to face it with a veneer of soul-destroying happiness. Cheryl in Accounts had six; he thought she might be near to breaking. He’d miss her. No one would know, of course – he’d smile along with everyone else as her coffin was carried into the company cemetery – but these people were his family now. His world. His future, until his own painful death. Wow! What an opening story to this week’s prompt. So much in here! Well done, Marsha. Wo-ho… I shouldn’t have read this; now I feel so inadequate. That is one hell of a story! Corporate branding – literally. Great story. The man was dressed like a Mormon missionary, but those cold eyes with dark eyebrow awnings filled my gut with dread. Even the way he guided me into the room had less of the welcome, and more of the inevitable. The room was white. Stark white. There were two rows of tables, one on my left, and one on the right, lined with people working on computer terminals. “Are you sure this is the right place?” I said. I turned and he was gone. So was the door. I started walking. A fat lady turned and gave me a jolly wave. A bald black man across from her spun around and called out a cheery, “Have a wonderful day!” A thin man with long stringy hair turned and grinned, giving me a peace sign. I could feel the heat rising inside me. “I hope you have a really, really great time with us!” said a man on the right. He had a thick beard, and sparkling eyes. He looked so warm and friendly, I was sure he was a damn Canadian. My fist clenched. “So pleased to see you!” called an old lady on the other side. I had a sudden urge to break her legs, but I couldn’t raise my arms. “Welcome! Welcome!” said an obese man, and I just wanted to punch his big gut and wipe that stupid grin off his face. “Have a nice day!” squeaked a perky cheerleader, jumping and waving imaginary pom-poms. I glared at her, but she kept smiling at me. I tried to stop, but my feet were on automatic, finally making the right turn at the end. “No!” I shouted. There was the fat lady with her jolly wave. “Have a wonderful day!” The bald black man. The thin guy with the peace sign. Love the way you use the small glimpses of details to build tension and make happiness suspect. Splendid story, Colin. Leaves us full of questions – always a good thing. Well done! It’s 08.30. 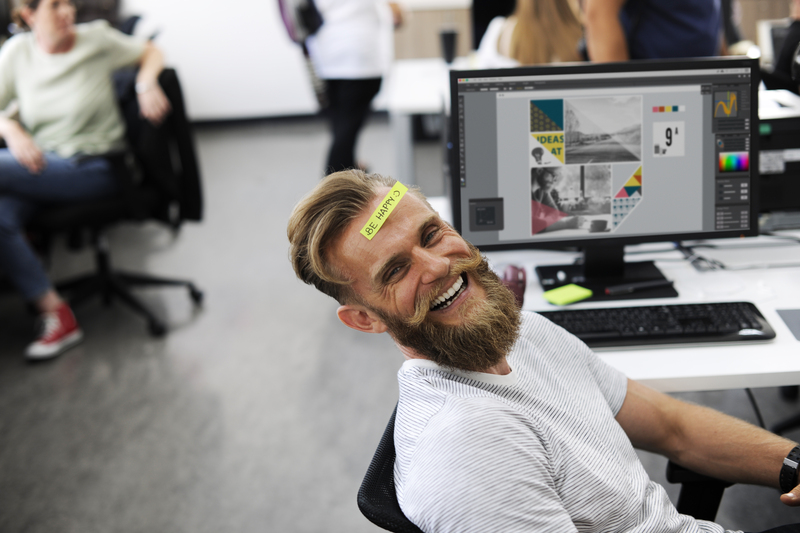 Too early on a random Monday morning for a happy guy with a beard and twirling moustache with a Be Happy post-it on his forehead to be sitting at my desk. This is my desk! Who are you? There’s only so much smiling I can take at this hour. Who’s got the coffee? What? The machine is broken! Again? What’s going on? Have I landed in another dimension? Where are the usual suspects with their gloomy faces, hangovers, family problems, relationship problems, boss issues, peer competition? Not to mention sales targets, marketing blurb wording conflicts, internet connection woes, double-booked meeting times, pressure and more pressure. Go away, twirling moustache man. Go back to your happy place and leave me in my misery I have made for myself. What? Whose future? Mine? He’s not my future – get outta here. I am NOT seeing my future in the form of this happy person. Yes, that’s my phone ringing. ‘Hello. Mom? Yes, I am at work. No, I didn’t have breakfast. Leave it, will you. What? ‘Mornin’ to you too, Mom. He always seemed so happy, too happy, that it must have been fake…forced. We used to laugh with him, wrap his happiness around us like warm blankets on cold nights and all the while we’d be queasy deep down…uneasy with it, as though we were bearbaiting or something. When he left, we’d feel colder, but more comfortable. On his days off, we’d all stay at our desks, working, pointing at piles of files with chagrin when colleagues caught our eye, making quick solitary coffee runs. We liked to think we were more productive without him, that he and his happiness were a distraction. And when he left for good for greener pastures, there was this strange and ugly mix of sadness and relief tainting the taste of champagne and words of congratulation. We knew what it was; we hid it behind screens and sips of coffee and bursts of raucous gossiping. It echoed in fading laughter, in the clicking of computer keys, in the repetitive sounds of office work hammering home the point. It made the coffee a bit more bitter, the days a little bit longer and the time a little harder to kill. It wasn’t that he’d been too happy…it was that we weren’t happy enough. Our well-worn ruts, gouged by circumstance and necessity were so deep, the sides were more like prison walls. He reminded us of it as he doled out sweet drips of happy, and it drew us to him like an oasis draws the desperate and thirsty. We had to believe his happiness hid something more withered than us because we knew he wouldn’t stay and we couldn’t leave. The final line of your second paragraph my very favourite, Sian. Super story! NIce imagery, especially in the last paragraph, conveys our ambivalence towards being happy. I wear my smile and wave as I leave the office, and they wave back. They’re happy, and I’m happy in turn because I can make them happy, day after day. The power of a smile and good humour. I was told never to underestimate that. So on the next day I cannot grasp what’s going on. My smile is still on, but it’s not working. They stare at me as if something was wrong with me, as if it was the first time they saw me. I go to the bathroom and check myself. No, nothing wrong: I’m the usual me, longish hair, carefully controlled beard and moustache, sparkly eyes, eternal smile. A guy from marketing tells me the company’s bankrupt and they’re going to lay us off. We’re out of a job. Yet my smile stays on. As always. He stares at me and tells me I must be mad. The others shun me. They’re all crying. They don’t smile. It’s not my fault that my programming was never completed. I love this ending, Vicente! If only it could always be this way! Well done. Oh, that last line! What a great story. Jesus reclined in his chair, a contented smile on his face. Time to rest, be happy. He had spread the Word. Others, who followed a different God had also spread their message – different but ultimately the same; he could live with that regardless of Dad’s insistence on being Number One. They had all given humanity a code to live by, a morality to reduce suffering, a tenet of peace. What could go wrong? Mutterings came from behind him, faces turned towards each other, a rumble birthing a thunder, clashes of ideology. What would they do when he had gone? He ignored it and closed his eyes. Time to leave them to it. War raged across the face of the earth. Refugees flooded across borders, sometimes admitted, more often turned back. Bombs flashed in civilised cities and vehicles mowed down the innocent. All in the name of religion. Every single commandment had been broken, even by those who preached his words. And all of them were blind to their faults: zealotry, hypocrisy, bigotry; blinkered by their religious zeal. Suffer the innocent, the words came back to haunt him. Wearily he rose again. The question was, would they recognise him? Fabulous take on the prompt, Steph. He was a failed prototype that the company got cheap, an android designed to boost morale and increase productivity. His name was Tim. He had the right look, a goofy beard and a wacky smile, but he couldn’t make people laugh. His extensive joke database was useless, because his timing was never quite right. He was also programmed for physical humor, but it always came off as odd, rather than funny. Like the time he wore a “Be happy” sticker on his face all day, or dropped a banana peel on the floor and slipped on purpose. He’d been placed in a central cubicle to maximize his impact, but people tended to ignore him. Shunned like a high school nerd in a 1980’s teen movie, although he had the capacity for cognitive computing and deep learning, his isolation made it impossible for him to improve, but unfortunately, he never gave up. When productivity plummeted after they acquired him, management promoted Tim and moved him to an office created from an unused closet. When they relocated, they “forgot” to tell him their new address. Karl was a miserable soul. He liked nothing better than a good moan. The only thing that made him feel really bad was when he was happy. It was a confusing situation for his colleagues, but not for his friends; he had none – which is what he wanted. Friends would only want to spoil his day by making him happy and who would want that? One day at work Billy, was a bit of prankster, told him a joke and he laughed genuinely at it. No-one, not even Billy, can remember what the joke was, but Karl actually cracked a smile, which made everyone around him stop what they were doing and watch him. For they had never seen such an event. His eyes creased up, his lips curved up and Shell from accounts said she actually saw some teeth. It would have been the stuff of myth and legend if it had only happened that once. But it didn’t. The event changed him and now Karl walks around with a permanent grin on his face. So he is only happy when he is happy now – which is all the time. That too is confusing for his colleagues and his friends; for now he has friends – and they make him smile even more.